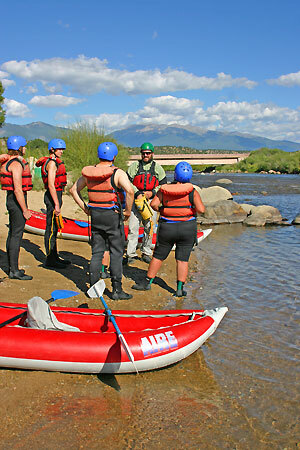 The increasingly popular Boy Scout whitewater merit badge clinic at River Runners will be offered on the Arkansas River in Colorado for the seventh season in 2012. Rafting Browns Canyon on the Arkansas River in Colorado. All Browns Canyon rafting trips launch from our private beach, which makes the logistics easy for everyone…and the kids love it. River Runners, a Colorado rafting company with two locations on the Arkansas River near Browns Canyon and the Royal Gorge, will offer Boy Scout whitewater merit badge clinics with advanced reservations May 1 – Labor Day, 2012. According to Eileen Peterson, general manager at River Runners, the whitewater merit badge clinic is $100 for up to 10 participants and an additional $10 per person after the minimum course fee is met. She said scouts also must participate on a half day or full day Browns Canyon whitewater rafting trip for an additional fee, and complete a separate first aid and CPR course to earn the whitewater merit badge. Peterson said the whitewater merit badge is a familiarization-level clinic that teaches Scouts the basics of whitewater recreation and safety. Drills include crossing river currents, retrieving swimmers with a throw rope and paddling an inflatable kayak. The course typically takes 90 minutes to two hours depending on the size of the troop. Three group campsites – that can accommodate 15-20 campers - are available for $40- $50 per night. Peterson recommends that Boy Scout groups book these sites well in advance as space is limited and dates are already booking up. Each site includes a fire pit, picnic tables and use of hot showers, bathrooms, sand volleyball court, horseshoe pits and catch and release fishing. All River Runners merit badge counselors are registered with a local scout service center and have completed Youth Protection and Safety Afloat courses through the Boy Scouts of America online course program. 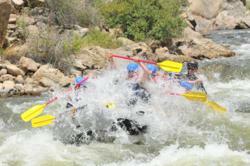 In 2012, River Runners will celebrate 40 years of whitewater rafting on the Arkansas River. Choose from two Colorado rafting locations – Buena Vista and Canon City, Colo. that offer half day, full day and overnight river trips on beginner, intermediate and advanced whitewater. Learn more about the River Runners Whitewater Merit Badge Clinic and other Colorado whitewater rafting adventures at http://www.whitewater.net or call 1-800-723-8987. Boy Scout whitewater merit badge clinic on the Arkansas River in Colorado.Whitewater merit badge courses in Browns Canyon. River Runners Riverside Rafting ResortBuena Vista, Colorado Mt. Princeton Hot Springs ResortColorado whitewater rafting and hot springs packages.